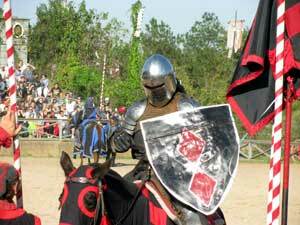 Some time back, we picked a weekend to head south to meet our daughters and the grand kids just south of Plantersville for two days at the Texas Renaissance Festival. Since it's very hard for us avid duffers to let a weekend go by without playing golf, we stopped at Woodforest Golf Club for 18 holes before we headed to the Renaissance Festival campground and after camping at Huntsville State Park we couldn't drive past Raven Nest Golf Club without playing 18 before heading back home. Woodforest Golf Club has 27 holes and we played the Front and West nines. The Front nine is a pretty traditional nine holes of golf that if you can putt, you should have a good score heading into the more difficult back or west nine. Most of the holes on the Front nine are straight, with wide and forgiving fairways, and no hidden trouble, until you get on or near the green. The greens, on both nines we played, were about average size, in near perfect condition, held well, and were very fast. Slope, undulation, and subtle breaks make it tough to one putt. The West nine is a different story. Like the Front nine, the fairways and greens are near perfect, the bunkers have soft fluffy sand, and the rough can be tough - thick but playable. This nine has some great holes with dog legs, tight approaches, pond and creek hazards, and strategically placed bunkers, plus the tough fast greens. All in all, a fun 18 holes of golf and a must play if you're near-by. Great way for us to start the weekend. 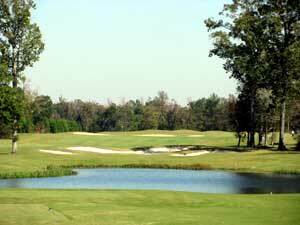 If you're interested in this course, then you should read our review of Woodforest Golf Club. We meet the daughters with 3 grand kids plus one new boy on the way at the golf course and then headed just down the road for margaritas and Mexican food at a highly recommended restaurant. And we weren't disappointed. 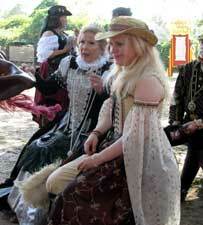 With a fully belly it was off to the primitive campground at the Texas Renaissance Festival. The primitive camping area was packed with hundreds of tents and campers of all shapes and sizes. 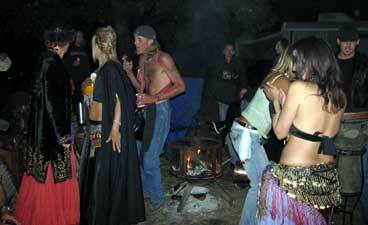 You could hear the bongos playing, smell the smoke, and see several campfires spread over multiple wooded acres. We quickly leveled the motor home grabbed a couple cold beers and for the next few hours meandered from campfire to campfire, socializing, meeting a variety of friendly characters, and some very loyal Renaissance fans. We encountered lots of fun loving very friendly people in a wide variety of 16th century costumes, partying and playing bongos around their campfires. We ended the evening at the huge central bonfire with hundreds of other Renaissance fans dancing, laughing, and partying to the beat of 5 to 10 different bongo players - fun evening. The next morning after a good breakfast we parked the lawn chairs along the walking route from the campground to the festival entrance to watch all the costumed characters headed for a fun day at the festival. 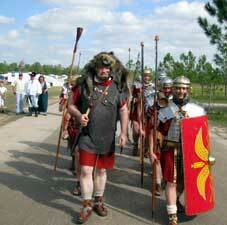 We were amazed at the number of people dressed in costumes ranging from bed sheets made into togas or monk outfits to very elaborate dresses and outfits for maidens to knights. The grand kids couldn't figure what the heck was going on! And then we walked a short distance to the entrance and joined all the other Texas Renaissance fans (over 32,000 attended that Saturday, yet it didn't seem crowed), a large majority of whom were in costume. We got there just in time to see the daily Renaissance parade that includes fans in costume, all the performers, and all of the shop vendors - you got to view belly dancers, winches, maidens, knights, barbarians, nuns, Roman Legionnaires, and lots more. 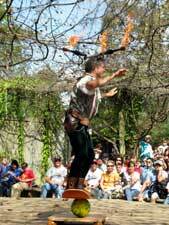 The Texas Renaissance Festival is held in a recreated 16th century village on 53 acres of well landscaped and decorated grounds under the tall Texas pines. Within the village are over 300 shops, all staffed by with fun loving merchants in period costumes, offering arts, crafts, food, and drink. As you meander along the cobblestone path, you pass 16 different stages with over 200 daily performances including singing, juggling, story telling, belly dancing, and music ranging from bagpipes to drums, flutes, and guitars. There are plenty of choices for food (Greek, Italian, Texas BBQ, English, and more) and several pubs and taverns with music, comedy, and cold drinks. The grand kids enjoyed the elephant rides, costumes, archery, bungee bouncing, some of the juggling and music acts, and the jousting tournament in the coliseum. The adults enjoyed the cold beer, good food, variety of characters, some of the performances, and the wide variety of other things to see and do. We started early and ended late and still didn't see or do it all. So we came back the next day for more of the same! If you go, plan on making it a weekend, go in costume, bring money, and camp if you can. 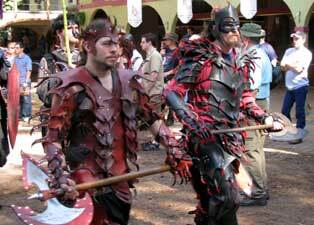 To lean more and see some of the elaborate costumes, read our review of Texas Renaissance Festival. After another fun day at the fair, Susie and I departed for Huntsville State Park to break up the trip home but mainly to play golf on Monday at Raven's nest. Huntsville is one of our favorite State Parks with good sites around the lake, hiking and biking trails, and a very pretty setting. Read our Review of Huntsville State Park to learn more. After spending the morning exploring the park, we headed to Raven Nest Golf Club just north of Huntsville State Park to get beat up by another golf course - why do I continue to punish myself by playing this frustrating, expensive, and time consuming game? Raven Nest is a fun links type course that offers some very fun and challenging holes and a good value. 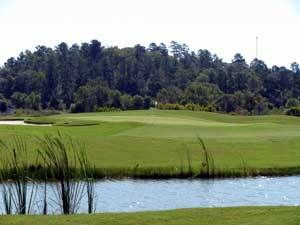 Read our Review of Raven Nest Golf Club to learn more.